The vendor area (aka “Expo”) is relatively small, and filled with universities, nonprofits, and ed-tech startups doing cool things. This isn’t a conference for big, traditional publishers extolling the virtues of the same types of products they’ve been selling for years. It’s easy for attendees to investigate, play, and find out about cutting edge tools that can help move education forward outside the status quo. Many of the vendors are looking for beta testers and are willing to offer discounts or free pilots in exchange for feedback. That can be a terrific deal for teachers on a shoestring budget. Educators who like to be the first to try something in their own classroom must just love this conference! Sessions are led by experts discussing topics and ideas that push the edges of their fields. From classroom teachers demonstrating how a new ed-tech tool has solved a pressing problem, to entrepreneurs sharing their latest invention, to policymakers discussing new government initiatives, the content challenges the norm. Presenters really engage with their audiences and some of the discussions become quite heated! In this digital age we lament how adults and kids alike are spending more and more time on their digital devices and losing the interpersonal skills. 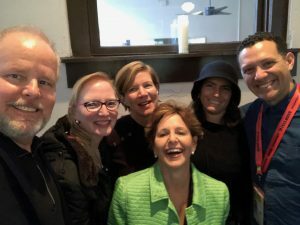 Well, the parties at SXSWedu are the place where the best networking happens, connections get made, and business gets done—face to face. At most other conferences there are a couple of large, sponsored happy hour events where some networking happens. Afterwards, attendees generally go to private dinners with their colleagues or with sales reps.
At SXSWedu, the parties start at 4 pm and last until the wee hours of the morning. Party-hopping and networking are the main focus of the evening. It’s easy get to the third or fourth night of the conference without actually having a sit-down dinner. Yet you’ve nonetheless been very well fed and haven’t lacked for beverages, alcoholic or otherwise. Finding out about and “scoring” invitations to the best parties is a fun, sporting challenge. It’s such a scene! The vibe is much more oriented towards “speed networking” rather than small private gatherings. Impromptu conversations and introductions on a rooftop deck party at SXSWedu have led to some of my most genuine and fruitful friendships and business deals. Let me know if you feel the same way about SXSWedu. And if I’m missing out on other conferences that are similar to this one! Image used with permission from Rita Ferrandino from ARC Capital Development.